eCite - How much exercise should be promoted to raise total daily energy expenditure and improve health? 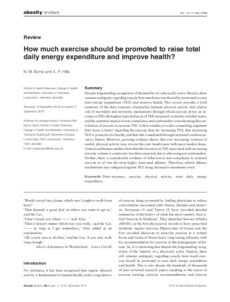 How much exercise should be promoted to raise total daily energy expenditure and improve health? Despite longstanding recognition of the benefits of a physically active lifestyle, thereremains ambiguity regarding exactly how much exercise should be promoted to raisetotal energy expenditure (TEE) and improve health. This review provides a briefsummary of the dose–response relationship between physical activity and relativerisk of morbidity and mortality; mechanisms through which exercise drives an in-crease in TEE; the highest reported levels of TEE measured via doubly labelled water;and the potential impact of non-compliance and confounders in moderating the con-tribution of exercise to increase TEE. Cohort studies provide a compelling argumentthat‘more is better’regarding the exercise dose for increasing TEE, that increasingTEE is protective for health, and that this is mediated through increased cardiorespi-ratory fitness. However, growing evidence shows that ever increasing volumes ofweekly physical activity may reverse the cost–benefit seen with more modest doses.Animal and human studies show that the elevation in TEE associated with increasingexercise volume is commonly less than expected, due to physiological confounders.Further, there is considerable evidence of behavioural non-compliance to plannedexercise in all but the most highly motivated athletes. Therefore, inbuilt defencemechanisms may safeguard against TEE being elevated to maximum levels.